Imagine a library that consists entirely of oral histories: interviews, first-hand recollections, personal narratives. Every interview is treated like a book—described and cataloged—and the recordings can be “checked out” online. Best of all, the intellectual content is linked to other resources that are held by other repositories statewide. Oral history is the process of recording and preserving memories that reflect first-hand experiences. Oral-history projects can target individuals and social groups who have been marginalized; first-hand stories can challenge a “status quo” understanding or a controlled message. In March 2012, a Colorado assessment showed that 96% of the state’s oral histories are not fully accessible. An infrastructure dedicated to oral history would put 100% of its resources toward making 100% of interviews discoverable, available, understandable, and usable. 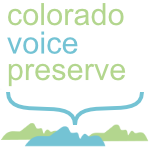 Colorado Voice Preserve (CVP) will work with libraries, museums, and community groups to develop oral-history content: identifying projects, loaning equipment, and supplying interview guidelines/protocols that ensure placement in the digital repository. Trained volunteers will assist with interview processing: transcribing audio; creating abstracts, key-word listings, and subject headings; prepping interviews for online search utilities; and posting interviews for Web dissemination. The mission is to connect our public with stories that explain the human consequence of events and decisions. Oral history is not itself an end. The recorded interview is raw material for new expressions of understanding: books, presentations, exhibits, documentaries. But that raw potential only will be harnessed when voices are preserved and made accessible. CVP embraces that responsibility, bringing oral histories into useful life so the captured voice fulfills its prophecy of informing public thought and action. CVP is supported by History Colorado, Colorado Humanities, and the Colorado State Library. The functional purpose of History Colorado is to collect, preserve, and interpret the state’s history for present and future generations. The larger ambition is to engage citizens in Colorado’s tradition and legacy. The humanities provide tools for examining the human experience and asking fundamental questions of purpose and meaning. Colorado Humanities brings these tools to communities via literary, cultural, and historical programs. The Colorado State Library provides leadership and expertise in developing library-related standards, activities, and services for school, public, academic, and special libraries. Each of these institutions has promoted the long-term sustainability of the Colorado Voice Preserve. During 2012, representatives participated in a planning process that shaped CVP’s organizational profile. While CVP is best described as an independent library, contributions from these agencies make the infrastructure collaborative, durable, and alchemical.